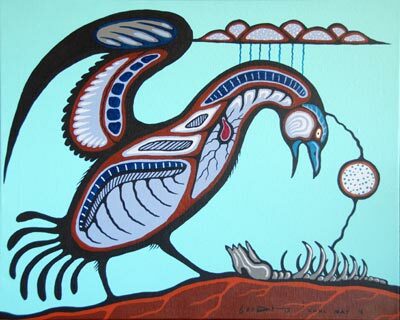 Description: acrylic on canvas 29"x23" signed Carl Ray '78. Ready for hanging as canvas on wooden frame is painted black around edges. Letter of provenance comes with this work from the teacher who purchased this directly from Ray in Sandy Lake to cover his flight out to Sioux Lookout. Ray was killed there two days later. This may have been his last painting? A very powerful and prophetic work.